Dennis could be 350 if he trains with the Camel Crew for 6 months. Dennis actually did go out to Oxygen Gym a few times in the early years, 2005-2010, when Dennis James used to arrange for pro's to visit there for a week or two at a time. So what happens over there Ron? Who pays for these guys to do this? Is there a rich oil tycoon who is a major schmoe or something? Why would someone over there pay to bring an athlete over to improve him for no benefit and then ship him back here? Maybe Bader himself finances it all? Edwards it seems it was not meant to be . Those where the days ,I started buying everything I could get from nutrex just because of wolf bro . But as you can see he looks like a mens phsqyue competitor here ? 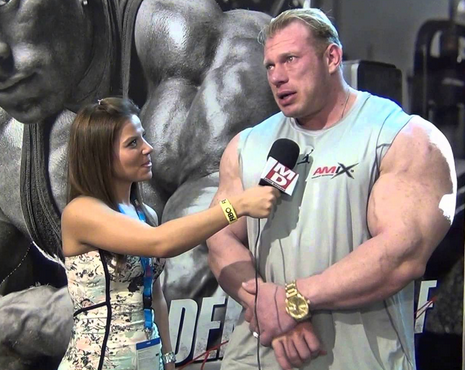 Well wolf should just relax, train ,eat ,enouy his wife and his daughter and his dogs .He has nothing to prove anymore , he will go down at top 4 european bodybuilder off all time . And dear I say top10 routine off all time at the 2007 olympia ?? If Wolf had great calves and came in bone dry , I'd have no problem with him winning the Olympia !!! Why not? Doesn't seem too personal and private, it's a bodybuilding story. My guess is Badar is like any wealthy patron of the arts throughout history. His gift is in supporting the artists and if he makes a big name for himself and his gym in the process it's a double win. Oil money is the obvious bet, it's Kuwait. But the guy is obviously a big bodybuilding fan and a collector of sorts. If you had many millions of dollars why not buy the best vip season tickets and athlete access in the ifbb. That's a good guess. If anything is clear in all this is that Bader doesn't the guy who is looking for money, fame or protagonism.